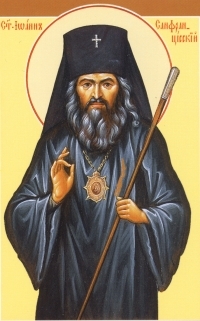 Welcome to the web site of the St. John of Shanghai & San Francisco Brotherhood of St. Vladimir Church in Ann Arbor, MI! Our Brotherhood was formed with the blessing of Archimandrite (now Bishop of Cleveland) Peter, Administrator of the Diocese of Chicago & Detroit on February 2, 2003. Our Brotherhood exists to support the Mission of St. Vladimir Church, namely "It shall be the aim of the parish to unite the believers around the parish church on the basis of the teachings, the canons, the traditions and the rules of the Russian Orthodox Church for the satisfaction of the religious need and moral benefit of its members." In addition, we strive, along with the rest of our Parish Family, to spread the Orthodox Faith to those living in Washtenaw County, MI. The Brotherhood provides the opportunity for the men of our parish to interact socially in a positive way as they support the parish and its goals and institutions. Specifically, the Brotherhood fulfills a list of duties before the weekly Divine Liturgy. These duties are shared by all brothers on a rotating basis. The schedule for the present month is found here.